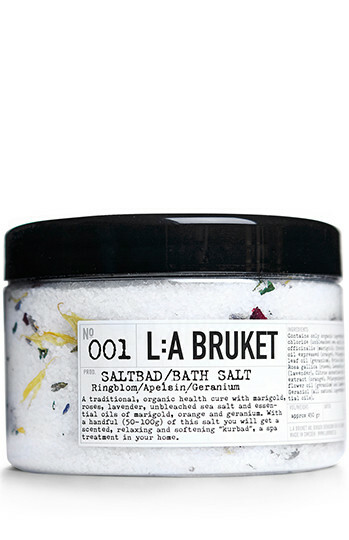 Organic bath salt by L:A Burket. This traditional, organic health cure is made with petals from marigold, rose and lavender, creating a beautiful and colorful floral bouquet in the salts. The natural, unbleached sea salts are infused with essential oils of marigold, orange and geranium, giving a delicate fragrance. With a handful (50-100g) of this salt you will get a scented, relaxing and softening “kurbad” (spa treatment) in your home.